Izzy’s own beloved pets are dressed to the nines for the grand opening of Trendy Tails. Feisty feline Jinx is large and in charge, and happy mutt Packer is lapping up the attention. Izzy and her best friend Rena have their hands full meeting Merryville’s menagerie and serving tasty pupcakes and kitty canapes from their “barkery.” The last thing they need is the town’s local activist, Sherry Harper, scaring off customers and getting tongues wagging by picketing the event. The two manage to stop Sherry’s protest in its tracks, but the trouble for Trendy Tails is just beginning. Sherry is found murdered in back of the shop, and Rena is immediately named as the lead suspect. Now Izzy and her furry friends have a new pet project—collaring a killer. 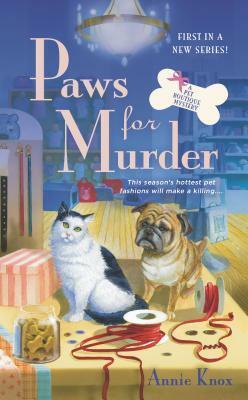 This story was a fun start to the Pet Boutique Mystery series. We have tried costumes on our pets over the years. None of them were ever too happy about it but it is a very cute idea and practical for those pets that venture outdoors in the cold winter months. I enjoyed the way the author tied the story to my home state of Wisconsin too, with a dog named Packer, and characters that went to college or moved from Madison. All he characters both two legged and four legged were introduced to us quite well in this first installment. I have a soft spot for Aunt Dolly, of course, us Dolly’s need to stick together. I love the way she supports Izzy both with helping her open Trendy Tails and in any other way she can. She even dons 4 inch platform sandals and “dresses up” to catch the eye of a crotchety store owner trying to make trouble for Izzy. Aunt Dolly is a hoot!! Izzy is a strong protagonist too. Her life was turned upside down by a man. They had their whole future planned but just when they were supposed to be a making the move to New York, he changed his plans and left her behind and took another woman with him! She had to pick herself up, dust herself off and get on with her life. She does that with Trendy Tails. At least she was in her hometown surrounded by friends and family. Going into business with her best friend Rena was the perfect choice. Hopefully she can patch thing up with her old friend Sean too. Their friendship had added rather abruptly but now that they are both back in Merryville she are going to constantly bumping into each other. There are many more interesting characters who reside in Merryville. It is one of those small towns where everyone knows everyone or they have heard gossip about each other. A perfect setting for this cozy mystery series. I did see the writing on the wall a bit before the guilty party was revealed, but this still a wonderful mystery. I enjoyed the story so much I have already started reading Groomed For Murder. It hits store shelves next week! Find out more about Annie Knox and her books on her webpage here. Annie Knox will be my guest for Cozy Wednesday! This sounds like a really fun cozy series! This on my TBR list. I am looking forward to reading it. sounds good.i love the cover with the kitty and the doggy. This looks like such a fun book – I’ve been meaning to read this one! Review – Sacrifice by Mathew Paust Cozy Wednesday with Annie Knox – Author of Groomed For Murder – Giveaway too!